Assalamu alaikum! In my last article, I introduced my top ten tips on how mommies could translate their skills and share them with the world in the form of a blog. Whether you’re a stay-at-home-mom or a working mommy (or both! ), we all have tips and advice to give to others. 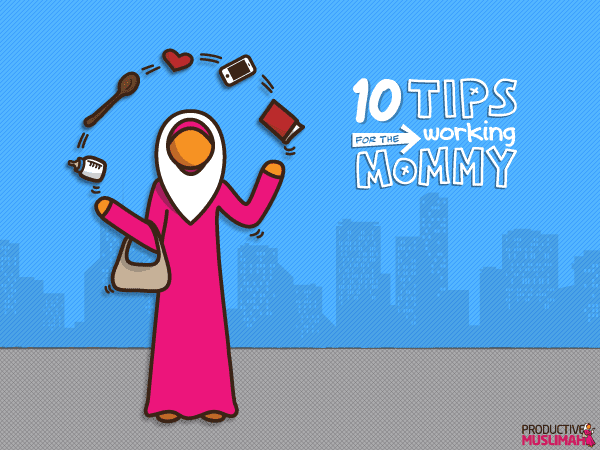 In this part, I’ll be telling you how working mommies can maximise productivity using these ten simple tips. Buying groceries and preparing meals for a family can be quite time-consuming and sometimes even a bit daunting. However, you can cut down time significantly by planning your meals ahead of time and by making a weekly schedule of your meals, i.e. deciding to have lamb on Mondays, fish on Tuesdays, vegetarian on Wednesdays and so on. Stick to it so you know exactly how much of each you need to buy at the beginning of each week. Furthermore, do some prep work in the kitchen. Make some food items that can be easily frozen during the weekends or evenings, that you can pull out of the freezer during a busy week. Such items can include frozen meatballs, soups, casseroles – the list is endless! Having pre-cooked meals allows you to focus on your husband, your children and your ibaadah, without having to worry about spending time in the kitchen. Online shopping is also especially useful for grocery shopping as the websites will list products of all prices. This means you will be able to find the cheapest brand online, as these are easy to miss when browsing around the supermarket. Online grocery shopping also allows you to restrict yourself and buy only what you need, as you resist the urge to pick something you may see on offer, but don’t necessarily need. These ahadith clearly show that a man helping his wife in the house is not an unnatural thing. Although a majority of the responsibility falls on the mother, know that a team effort from everyone will make life more manageable. 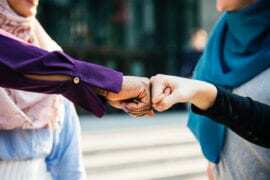 In particular, if both you and your spouse work, then it makes sense to help each other out and share tasks such as cooking and doing the dishes. This teamwork will increase the love between you and make you appreciate each other more. Furthermore, delegate small jobs to your children; children can help make a salad or set the table for instance. Whatever your schedule is, make sure prayer is a priority. If the time of prayer has started when you come back from work, then pray first before starting your household chores. Do not delay your salaah because of dinner preparations or helping children with their homework; tiredness may delay you even further and before you know it, prayer time may be over without you even realizing it. Use an adhaan app on your phone to remind you to perform your prayer and make a habit to leave everything you are doing as soon as you hear it. This policy is a fantastic, practical tool for instilling the importance of salaah in your children – if they see mommy drop everything as soon as she hears the adhaan, they will start doing this too. As a working mother, you have to make sure you have time for the housework, prepare meals, be on time for work, run errands, take care of sick children, and go to parent-teacher meetings. In the midst of it all, it is very easy to forget to schedule time for yourself. Make sure you take care of your needs as an individual; after all, a happy mommy is a productive mommy. This includes getting adequate sleep, eating a well-balanced diet, fitting in time for light exercise (like walking) and unwinding with a hobby or simply reading a book. Although this sounds almost impossible considering the schedule of a mommy, if you get into the habit of preparation and effective delegation, it is easier for both mommy and daddy to fit in ‘me time’, both alone and together. Unfortunately, it is all too easy to waste precious minutes and hours watching TV or scrolling on your tablet or phone. It really is crucial to break away from these bad habits and utilize that time wisely, especially for ibaadah. If you’ve got time for 30 minutes of a TV programme, you’ve also got 30 minutes for Qur’an! Finding backup childcare in advance is key for every working mother. If you are stuck at work or in traffic and cannot pick up your children from school or daycare, then make sure you have a person you can call to pick up your kids. Enlist the help of a neighbour, family member who lives close by or the mother of another child in school. This is helpful even if you are a work-at-home mom, as it is a good idea to have someone come and watch your children at short notice when you have an overwhelming workload. “The example of a good companion (who sits with you) in comparison with a bad one, is like that of the musk seller and the blacksmith’s bellows (or furnace); from the first you would either buy musk or enjoy its good smell while the bellows would either burn your clothes or your house, or you get a bad nasty smell thereof.” [Al-Bukhari]. Get to know other Muslimah mommies in your area, so you have someone to talk to when you are stressed. There is no other person who will understand you better than another Muslim mother who has been, or is going through, the same situation. Local mosques sometimes have playgroups where kids also meet other Muslim children to play, while the mothers can catch up with each other over tea, so both the mother and child benefit from good companionship! If your mosque doesn’t currently offer this, try and set one up yourself – they are relatively simple to organise and In sha Allah you will gain immense reward for bringing Muslims together. For working mothers, with balancing career and home life, it is very easy to over-work yourself. Thus, it is essential for you to take a break from your work in an effort to rejuvenate yourself. If you work outside the home, make sure you book your paid vacation time months in advance and utilize that time wisely, especially during school holidays when you can really spend time on your children. 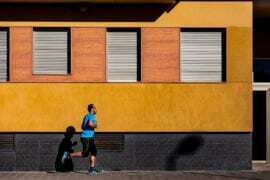 If your finances permit, you can take cheap city breaks; often, holidays are thought to mean flying abroad, but I guarantee your home country has so many places to offer, for a fraction of the price. You don’t necessarily have to leave your city, so perhaps you can use that time to do a hobby at home with your children like baking or arts and crafts, or take them to the zoo or park. Finally, the key to any aspect of productivity is to keep your life simple; aim high, but don’t over-book yourself and realise that sometimes you won’t do a perfect job. But that’s okay! Learn to let go of perfection: your house will not always be clean and you may not always be on time for appointments. You may not be able to attend every school field trip with your children, and you won’t be able to attend every social event with your extended family. You don’t have to feel guilty about these things at all; you have a lot going on and you should give yourself some credit – you’re doing the best you can! Well, there you have it my sisters! It may take some time to implement these tips, but with a sincere intention and some hard work, I hope my advice will make your life much easier! How do you balance work and family? Leave your comments below!